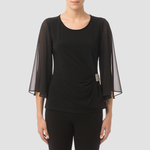 Stunningly elegant chiffon blouse with diamante detail. 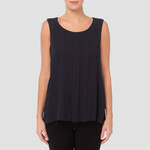 This sophisticated blouse features a full sleeve and a V neckline. It benefits from two layers with a floral patterned fabric in a shrug like overlay and is finished off perfectly with beautiful gold diamante stud detail across three bridges on the front. These gorgeous colours are so fresh and unique!